The Natural Earth Quick Start data set. This is a collection of public domain map data that describe the planet, (http://www.naturalearthdata.com/downloads/). You only need this if you don’t already have some data describing coastlines, countries etc. We are going to use weather forecast data from the Global Forecast System (GFS) of the USA’s National Weather Service (NWS). However if you navigate to the above link you will be confronted with data files in some difficult to use scientific formats such as GRIB (Gridded Binary). 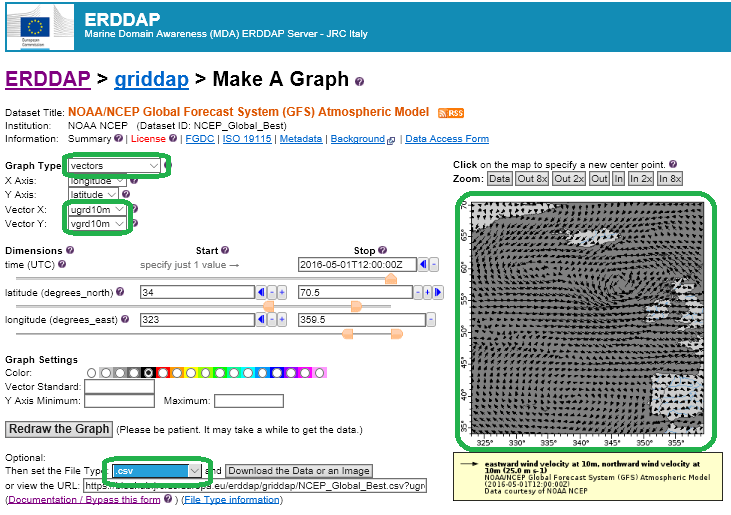 Fortunately the GFS forecast is also available on an ERDDAP server. ERDDAP is Cloud based data broker designed to act as the intermediary between developers/users and scientific data formats (particularly gridded data). Please see my previous post for an introduction to ERDDAP. On the landing page enter ‘gfs’ into the search box’. This will return two data sets, select the GFS one by clicking on the ‘Graph’, this will bring you to the data query form (see figure) which we can use to get data and to construct a URL query string that can be reused at later date. The query form for the GFS data, parameters to change are highlighted with green. Click on the map to get the data for area of the Earth that you are interested in (try the North Atlantic for this example). Once you have made the necessary changes click on the ‘Download Data or Image’ button to get your data. Copy the data from where it downloaded to a working directory. Below is a link to the query I used when I was writing this post. GIS programs all want data with longitude values within -180 to 180, but many data sets have longitude values within 0 to 360. So if the data set already has longitude -180 to 180 values you do not need to do this conversion. However in this example we do need to convert. Now calculate the new longitude by dragging the equation cell down the spread sheet to last row of longitude data. A quick way of doing this is to select the cell with the equation, then Shift + Left Click the last ell in the column that you want to populate to and finally Ctrl D (this is the process works in Excel). To calculate the wind direction we need to apply the arctangent (atan2) with the arguments U & V.
The format of atan2 in spreadsheets is different from that used in programming languages and some GIS application in that it has the parameters reversed. Populate the column by dragging the equation down to the last row with data. Enter the name Wind_Dir into the first cell of the column. Populate the column down to the last data row and put the name Wind_Speed into the first cell of the column. Give the spreadsheet a name and save it as CSV file. 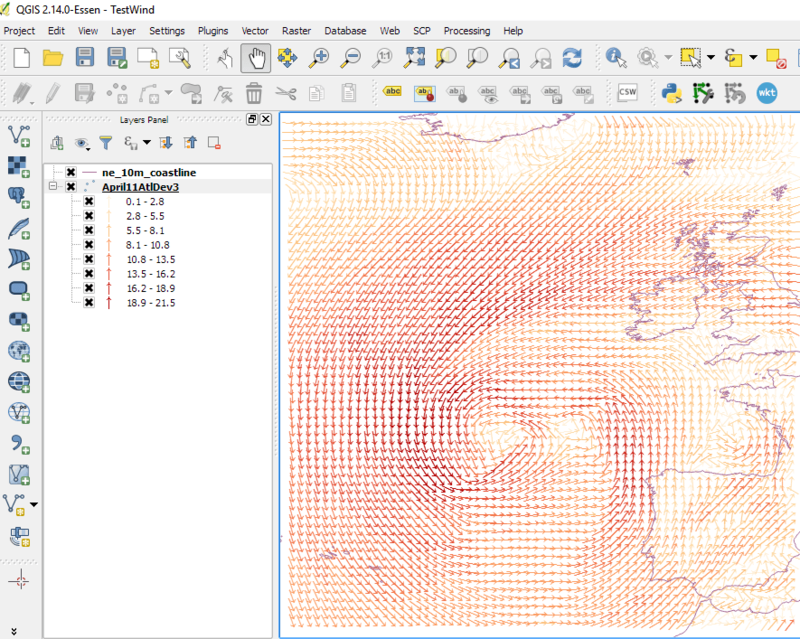 Finally we come to section where we import the wind data in a GIS and display it as a layer. In many ways this step is the simplest since all the difficult data wrangling has already been done. To start open a new blank project in QGIS (or ArcMap, the process is very similar) and click on the ‘Add Delimited Text Layer’ button which is usually found on the left hand side of the screen. This will trigger ‘Create a Layer from a Delimited Text File’ form. Click on the ‘Browse’ button and navigate to, and select, the CSV file that contains the processed data. Check everything on the ‘Create a Layer…’ form making sure that the CSV option is selected and that the x field is longitude and the y field is latitude. Click on the OK button select ‘WGS 84’ from the coordinate reference systems of the world. Click on the Symbol and choose the simple marker of and arrow pointing up. Now change the symbol layer type to ‘Font marker’ scroll down to the bottom of the font grid and select the arrow pointing upwards. Now select a field for the rotation of the arrow, this is to the right hand side of the rotation text box, the field you need to activate should be Wind_Dir, unless you have used a different name. When you are returned to the GIS the layer should be populated by arrows which are pointing in the direction of wind flow, the arrows will also be coloured based on wind speed. 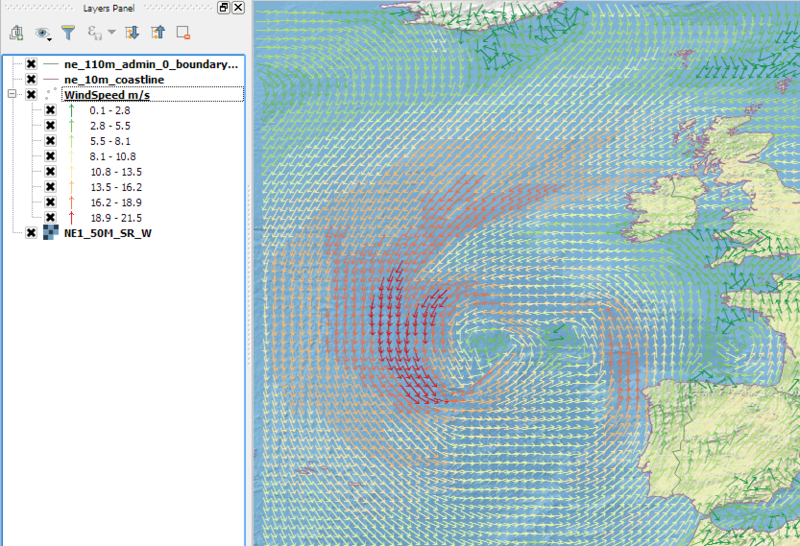 To put the wind data into geographical context we can now add a layer of global coastline data. This is contained in the Natural Earth data folder that you download earlier. Click on the ‘Add Vector Layer’ button in the left hand side of QGIS and navigate to the Natural Earth Data folder and select the file ‘ne_10m_coastline.shp’. A small bit of effort will greatly improve the presentation of the wind data. In the figure below I added some data layers from the Natural Earth data resource and tweaked the colours for wind speed. 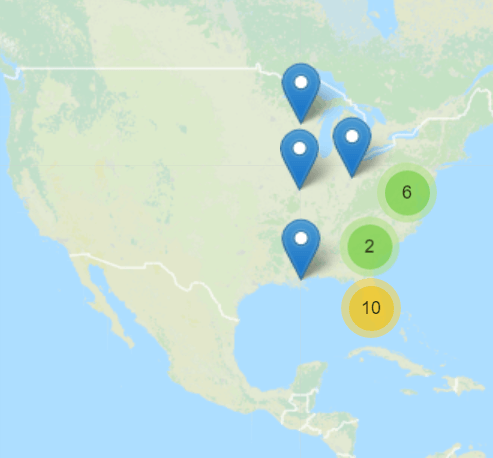 So long as you pay attention to dates and projections you too can be using GIS to make ‘mashups with heterogeneous data’! Enjoy! Environmental insights via data science. I enjoy empowering others through good ICT. Former Sr.Research Fellow @EU_ScienceHub. #OpenData evangelist.